Film, whether amateur, commercial or art, is one of the most powerful media in terms of depicting a society’s values and current thinking. From Hollywood to Bollywood to Iranian cinema, this medium has been used to highlight issues pertinent to a society’s existence while many a time, also used as a tool for propaganda and diplomacy. With the fall of Pakistani cinema from grace over the years, there have been a few platforms for amateur film-makers to experiment and present their art to a thinking audience. Kara Film Festival was a beacon of hope that, to some extent, brought Pakistani artists, directors and documentary makers into limelight. While an impressive achievement in its own right, Kara is still far off to many amateur artists who cannot afford the budget or time to cope with the frenzy of such a film festival. Then came FiLUMS; the landmark event of LUMS Media Arts Society, that provided a reachable platform to budding film-makers regardless of their backgrounds, nature of subjects of interest and any budgetary constraints. Since it’s inception in 2006, FiLUMS has been a regular occurrence that grows even bigger and better with each passing year. This year, FiLUMS is gearing to be the biggest and the best to date with entries from as far as Turkey, Serbia, Abu Dhabi, Ireland and the United States. Along with film premiers and screenings, the three-day festival (February 11 – 13, 2011) will feature workshops and talks judged by the likes of Adeel Hashmi, Ayesha Khan, Omar Khan, Bilal Lashari, Fasi Zaka, Syed Noor, Adil Sher and many more. Highlight of the event will be the award night at the third and final day of the festival on February 13, 2011. Refer to the FiLUMS schedule here. All three chapters of The Indus Entrepreneurs (Lahore, Karachi, Islamabad) are organizing TiECon 2010 Conference this Saturday at Royal Palms Golf and Country Club, Lahore. The theme this year for TiECon 2010 is ‘Unleashing Change’. Official promo of TiECon 2010 – ‘Unlashing Change’. TiECon 2010 Pakistan is an annual flagship event of TiE and it is the first time in history, it is being organized in collaboration with all three TiE Pakistan chapters. As the theme explains, this years event focuses on unleashing the change about Pakistan and its tremendous potential in growth. At a time when a significant gap exists between the vast opportunities that Pakistan has to offer fearless entrepreneurs and the perception of the country abroad, TiECon 2010 Pakistan brings together global thought leaders on home soil. Together, through the power of ideas, the conference aims to catalyze entrepreneurial minds to unleash change and create opportunity. The aim is to expose the potential in Pakistani human resource and explore the opportunities for the entrepreneurs of the country. This is how Monis Rahman, CEO of Naseeb Networks was able to win trust of the venture capitalists to get the funds approved for its flagship product Rozee.pk even when the investors had reservations regarding the less known country of the world… Pakistan. Read the story of Rozee.pk and how other successful entrepreneurs are doing good for not only themselves but for their country, at Meet Pakistan’s Real Revolutionaries. The conference brings together a mix of leading local and international entrepreneurs, investors and business leaders. Collectively they will inspire, motivate and create inertia for change in their respective areas of expertise. This year’s TiECon will be organized into a diverse yet equally critical group of sessions including riveting success stories of entrepreneurs, government as a facilitator of entrepreneurship, the societal need and impact of social entrepreneurship, media’s role as a change agent and creating entrepreneurs through high quality and ubiquitous access to education. Hosted in Lahore, TiECon 2010 Pakistan will provide delegates with a rich cultural exposure to what is often called South Asia’s cultural capital. The conference agenda incorporates carefully designed segments to sample Lahore’s historical magic, captivating music and infamous cuisine. 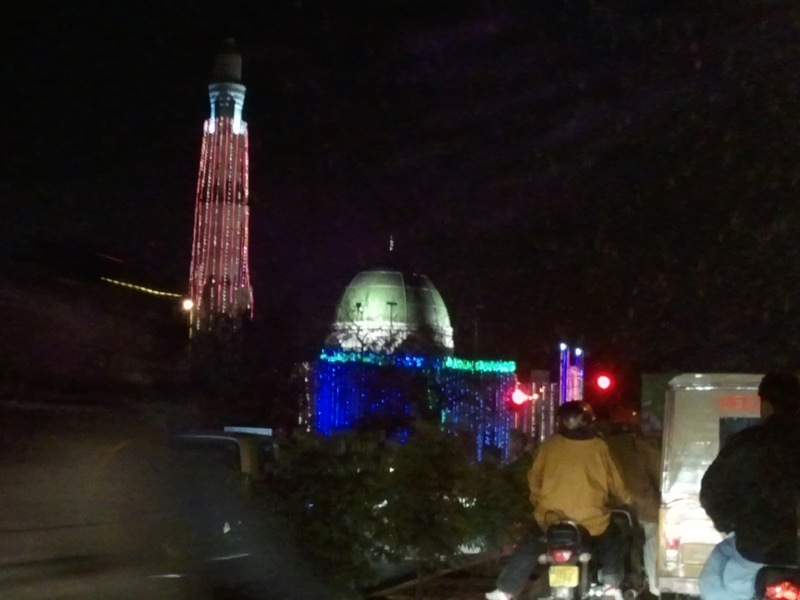 Time: 08:45 AM (sharp) – 06:30 PM. The event will be live streamed on the TiECon 2010 website whereas, you can also track the event via Twitter at #tieconpk. The official TiE Twitter account to follow is @tieconpk. If you want to, you can also follow TiECon 2010 on Facebook as well. The Sanjh set (101 cards), now part of my collection, proudly sits on my own desk and keeps reminding me of the University of Gujrat but also tells a story of how artists of Pakistan came forward to share the miseries of fellow countrymen in real need by offering their art work that moved people to buy and contributing to the relief efforts. The inspiring act of Sanjh will go a long way and will be remembered in times to come. Sanjh team approached Pakistani artists and asked them to contribute their work to help flood 2010 victims. The team then arranged an exhibition that was opened by Ms. Salima Hashmi on September 4, 2010, at Alhamra Art Gallery, Lahore, and continued to run until September 10, 2010. Sanjh was well attended by visitors from all walks of life, many of whom were particularly excited about buying quality artworks at extremely affordable prices. Thanks to the contributing artists – the real donors and champions of this entire fund raising effort as they take home nothing except for their own goodwill in return of beautiful creations that they have selflessly donated for the cause along with the time, money and effort to execute them. On behalf of all flood victims, if I may, more thanks to Zahraa Assad, Saifullah and Zahra Mirza of RetroArts, Foaad Nizam of Danka, and Visual Artists, Imran, Sajjad and Usman for what they did [Also here and here]. Pakistan Software House Association (P@SHA) is organizing P@SHA ICT Awards 2010 in Lahore this October. This is the flagship event of the IT & ITES industry in Pakistan and P@SHA organizes this event annually to celebrate the innovation in local ICT industry. The awards are in its 7th year but it is the first time these awards are being held in Lahore. The awards are given to the winners in 24 different categories who will be judged by a panel of judges from the private and public sector. Registration is FREE but COMPULSORY! Register at http://tinyurl.com/pashaictawards and you’ll receive an email confirmation from P@SHA Secretariat to attend the event. There are other attractions as well. This time P@SHA is also providing an opportunity to those aspiring artists who just need a chance to show off their talent. If you sing, dance, perform magic tricks or are a great comedian, actor or entertainer, and if you are part of the IT community, P@SHA wants you! Put up a demo of your talent on YouTube before September 20, 2010. The deadlines are already over but I mentioned it again because if you believe you REALLY are the one.. I repeat, only if.. you are the one; you may want to check Jehan Ara’s post on P@SHA Talent Hunt or visit the official blog to see if you can be considered. Another attribute of this event is its official theme song. The theme song for the P@SHA ICT Awards 2010 is Green and White which is produced by P@SHA Chairman Yusuf Jan who also wrote the lyrics. Finally, the sponsors for this ‘IT Oscar Night for Pakistan‘ are Infotech, Microsoft Pakistan, Wi-tribe Pakistan, IBM, PSEB, Mixit, Intel, Dell Pakistan, Oracle, CIO Pakistan and others. 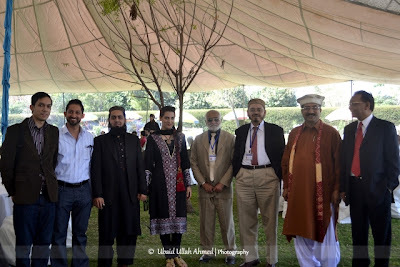 TEDxLahore – collective optimism, over and all! 31st of August, 2010 saw TEDxLahore return to the city with a whole new spirit. From the jam-packed Ali Auditorium to a comprehensive list of speakers, the experience was quite enriching and motivating for almost everyone who attended the talks. One can easily say that TEDxLahore’s second year with the theme of ‘Collective Genius’ was far bigger and better than the first one. Some 380 people were handpicked from more than a thousand applicants and all of them showed up! There were students, educationists, trainers, professionals, bloggers; people belonging to a very diverse and interesting group of individuals. Although some of the enthusiastic crowd was present at the venue two hours in advance of the planned timing, the event kicked off a bit late due to bad weather. The stage design was sleek and impressive, hats off to the people behind it. Same was the case with audio system provided by Bose, which apart from slight glitches worked pretty fine. Before the talks, a minute of silence was observed to honor the lives lost in devastating floods, Airblue plane crash as well as to the victims of terrorism. 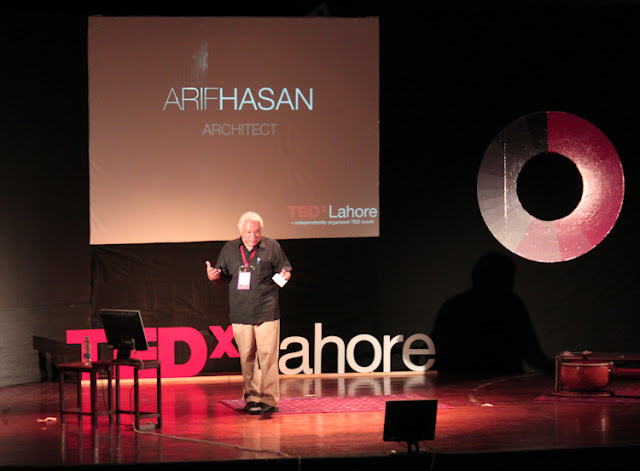 After that, Arif Hasan, a renowned architect, took to the stage and discussed socio-economic changes in urban planning after Partition. He was followed by the duo of Omar Sheikh and Jabran Rafique, both of whom are super-mappers and the guys behind Attabad Lake markings and mapping on Google Mapmaker. The only short-film filmed at TEDxLahore was titled ‘Building Pakistan’ with a patriotic theme depicted in a very innovative way. You can watch the video here. Ajmal Kamal – who talked about his dream of seeing everything written in Urdu available to everyone through print and electronic media. Dr. Tariq Rahman – shed some light on how code-switching (multilingual overlapping e.g. Urdish & Urdi) is not exactly a bad thing in literature or everyday conversations. Saima Zaidi – provided a visual treat by presenting the rich visual culture of Pakistan. References included a poster for Jhuley Laal, product packaging for Rooh Afza, Tibet Talcum Powder and a Mughal miniature depicting the folk love story of Shirin Farhad. She concluded her presentation with a resolve that we are a diverse and inclusive society as evident in our visual culture. Beena Raza came next with her introduction to Sangan Nagar Institute of Philosophy & Arts. Apart from very lengthy text on slides, it was interesting to hear about another effort to revive our culture. The show-stopper in the first half, without a doubt, was Noor Zehra’s mesmerizing performance on Sagar Veena. She played the instrument with so much ease yet captivating the whole audience in its magic. For those who are not aware, Noor Zehra happens to be Ali Noor and Ali Hamza’s mother. Almost all of these speakers kept the audience glued to their seats despite some of the participants occasionally snoozing off due to tiredness or inspirational overdose. Just before the second half started, refreshments were served which included samosas, rolls, ras malai and rabrri milk by Nirala. Participants also got some time to network, talk and discuss ideas with each other. The first half of the event was interesting but more on the informational side. Real surprise was packed in the second half of the evening during which each speaker was generously applauded by the audience. And yes, there were at least two standing ovations for Dr. Zeeshan Usmani and Mudassir Zia who honestly deserved it. Dr. Zeeshan Usmani is a full-bright scholar and an associate professor at GIK Institute who has developed a very comprehensive computer simulation model for tracking the effects of shock waves after suicide bombings. He currently has the largest database of suicide bombings in Pakistan, which has helped him develop an intelligent model very useful for pre-emptive measures, calculating human causalities and identifying the perpetrators. His genius and humor-filled presentation style won him accolade by everyone in the auditorium. If there was an award for man of the match, it would have easily been shared by Dr. Usmani and Mudassir Zia. Mudassir Zia was the only speaker to conduct his talk in Urdu, our national language, and perhaps the highest on inspirational value as he discussed remarkable achievements of his group of friends. His ideal of ‘first do, dare and then dream’ is very relevant to the current reality of our society where everyone talks big but does nothing. Mudassir and his friends have started a charity school (Ghulam Muhammad Grammar School), arranged patriotic street art competitions and conducted blood donation drives all by themselves without any external help or funding. Every member of their team works in his respective profession and then dedicates personal time and resources to all these noble activities. Dr. Nadeem-ul-Haque – discussed the paradigm of donor projects and production. Being the head of the Planning Commission of Pakistan, he admitted that our development is devoid of creativity and innovation because we give little creative and intellectual space to our youth. He was true is saying that we focus only on hardware (development projects) and do very less about changing the software (mind-set and intellectual skills of the people). Live on Skype from London, Majid Nawaz discussed the need to develop national consensus to identify our leaders, symbols, alliances and finally a progressive narrative. Relating to different ideologies, Majid mentioned how every idea needs these four elements in order to be effective and strong enough to unite any nation. Zubair Bhatti – the ex-DCO of Jhang shared his initiative of pre-emptive feedback gathering from common citizens. The idea is being implemented successfully across various districts of the Punjab where senior government officials call individuals to ask if there was any corruption witnessed by them. An automated telephone feedback line is also being started for recording complaints in this regard. Dr. Asher Hasan – the founder of Naya Jeevan presented his NGO’s work on provision of quality healthcare to the deserving most in our society. Finally, Dr. Aamir Khan came up with his dream of quality healthcare for all Pakistanis. With an impressive profile of achievements and successes, Dr. Aamir Khan, as the head of IRD, has initiated the use of mobile phone technology for mapping, tracking and curing pneumonia, TB and STDs amongst citizens of major urban areas in Pakistan. He acknowledged the genius behind mobile phones which has helped his system of paperless medical reports and patient data collection in the least developed areas of Pakistan. Rafay Alam, scheduled to speak about Critical Mass (a campaign to encourage cycling in cities), could not make it from Delhi due to a flight delay but was generously appreciated by everyone present in the audience for his initiative. Once the talks finished, Asim Fayyaz, Curator TEDxLahore, presented his concluding remarks which thanking everyone including the sponsors. What came later was a total surprise live performance on drums and dhol by Saad Sarfraz Sheikh and his friends. Adding on to the suggestions given by other fellow bloggers, I would also appreciate the effort put in by everyone from organizers to volunteers. Although, one can say that the talks did not exceed the TED caliber, still, they were pretty decent; some of them quite innovative and even inspiring around the idea of ‘Collective Genius’. Since, TEDx phenomenon has just started with at least three chapters in Lahore alone, one can easily hope that we will see a marked improvement in the quality and inspirational quotient of talks in successive future events. Hats off and two thumbs up for the organizers, speakers and audience at TEDxLahore! –	A goody-bag with TEDxLahore soundtrack, WWF Natura magazine, discount vouchers on books from ‘…the last word’ Qadaffi Stadium and a cute little plant gifted by the Horticulture Society. Pakistan Software House Association (P@SHA), TiE Lahore and Sofizaz in colboration with Lahore University of Management Sciences (LUMS) are organizing an interactive talk with Imran Sayeed who is an entrepreneur and technologist from the US. The event is supposed to be held at NIB Auditorium in LUMS and is a good learning and networking opportunity for entrepreneurs and people who are interested in entrepreneurship. Imran Sayeed, a serial entrepreneur, a consultant, an engineer, a mentor, a rainmaker, and a great supporter of many initiatives in Pakistan including the OPEN-MITEF initiative is going to be in Lahore on July 29. Imran is Senior Vice President, Global Architecture, Application Development and Management Practice and leads all commercial sector industry practices for Keane, a global BPO and IT Services company with ~14,000 professionals worldwide. Industry practices include Financial Services, Insurance, Healthcare, Pharmaceutial, Manufacturing, Retail, Hospitality & Travel and Energy, and together comprise most of the key business lines and customers for Keane. To read more about Imran Sayeed and the event visit Jeahan Ara’s blog post Interactive talk with Imran Sayeed.